For those that aren't that familiar with Thai food and perhaps were wondering why this blog is called 'krapow' I thought it's probably about time I explained. I went with krapow because the dish pad krapow is one of my favourite Thai meals. In fact I believe its one of the favourite meals of most Thai people, aside from Khao Pad (Thai fried rice) of course which is pretty much a daily staple for most Thai. This is one of the better specimens that I have purchased in Melbourne. I have only ever found it at Footscray and Springvale. Sometimes it is almost unrecognisable, if you see a back of wilted blackened leaves on the counter of a Melbourne Thai grocer for around $2 it's likely that the bag contains bai krapow that has seen better days. This is a magnificent specimen that I purchased from a grocer in Banglampoo in Bangkok. I wasn't able to cook with it but I had to buy it anyway, I was just so excited to see such it in such good condition, and it was only about 50 cents. This is another gorgeous bunch that I spotted in an asian grocer on a recent visit to see my parents in Townsville. Once again, I had to buy it!. At least this time I got to cook with it! The pad krapow was well appreciated although I did add an authentic amount of chilli which had most of our lips burning. Fortunately the same grocer had some awesome Thai cucumbers that helped sooth the heat. 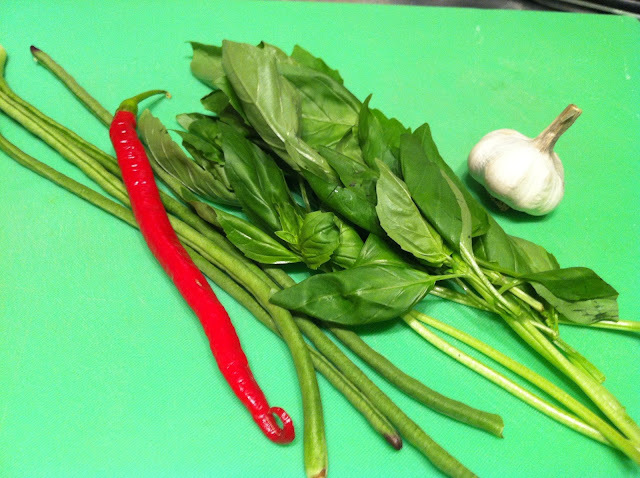 Pad krapow is simply translated with pad meaning wok fried (like in Pad Thai) and krapow of course referring to the holy basil. 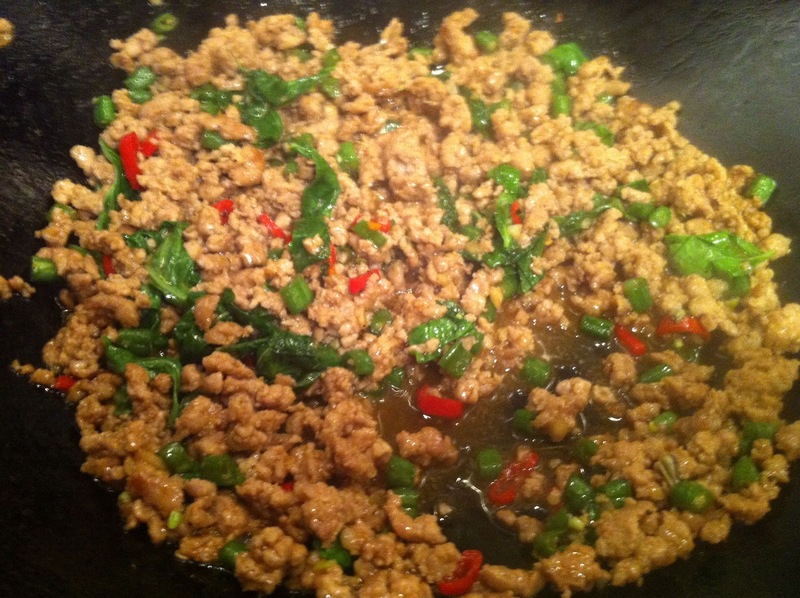 Pad krapow can be made with pretty much any kind of meat although pork is most common and my personal favourite. 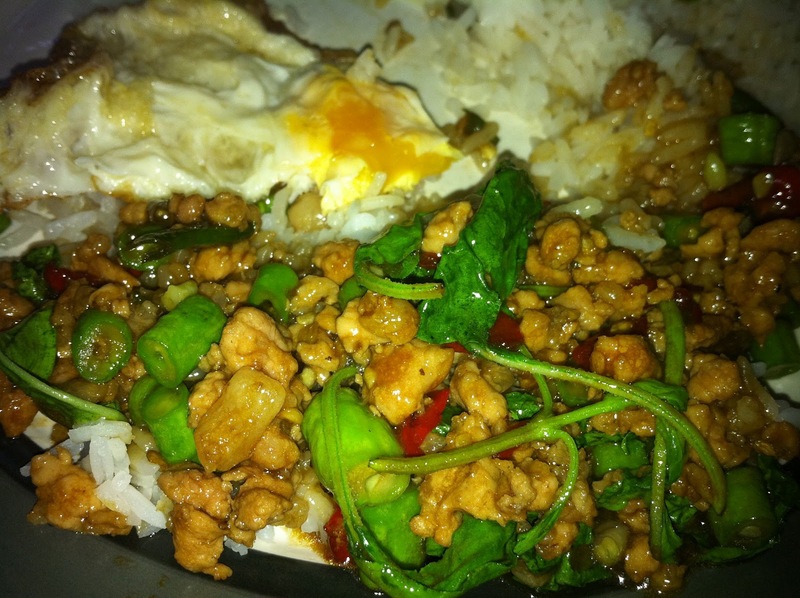 On a menu the protein is added after the pad krapow so you get pad krapow moo (pork), pad krapow gai (chicken) etc. This delicious looking dish above is pad krapow moo from a little hidden foodcourt in MBK Bangkok that is mostly patronised by the centre staff. We use the basic rule in Thailand being 'eat where the locals eat' so we ate at this little foodcourt every time we visited MBK (which was far too often) and I certainly became very familiar with their pad krapow moo. This foodcourt also doesn't use the annoying voucher system that you have to deal with at the main MBK foodcourt. Here's another great version from a restaurant in Phuket Town. I'd read a lot of recipes for pad krapow before we visited Thailand last year (including David Thompson's from his authoritative book Thai Street Food on which my recipe below is based) and none of them included snake beans (and neither did I when cooking it at home) so I was quite surprised to see that almost every version I tried while in Thailand contained them. They add a wonderful crunch and also a bit of vegetable variety to the dish. 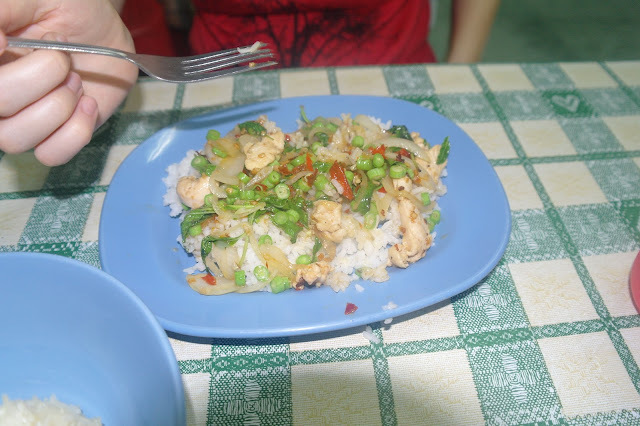 This is an old photo of a pad krapow gai from our very first trip to Bangkok. I asked my great uncle Colin's (who lives in Thailand) friend Prachan what his favourite Thai meal was and he answered pad krapow and wrote it down in Thai for me. We wandered down the road from our hotel that night and the first place we went into happily cooked it up for us. At the time we loved it, so very spicy but now looking at the photo I am wondering where the egg is! 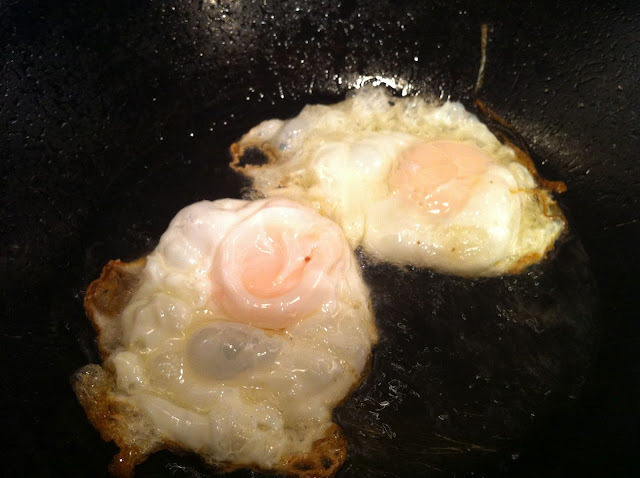 You have to have the egg, its fried in oil in the wok to get beautiful crispy edges but the yolk is left runny so that when you cut into it it bursts out and mixes in with the krapow sauce to create a taste sensation! OK so now I've got you salivating here's how I cook it at home! Pad Krapow Moo is a staple meal at our place where its cooked at least once a week and is always well appreciated. 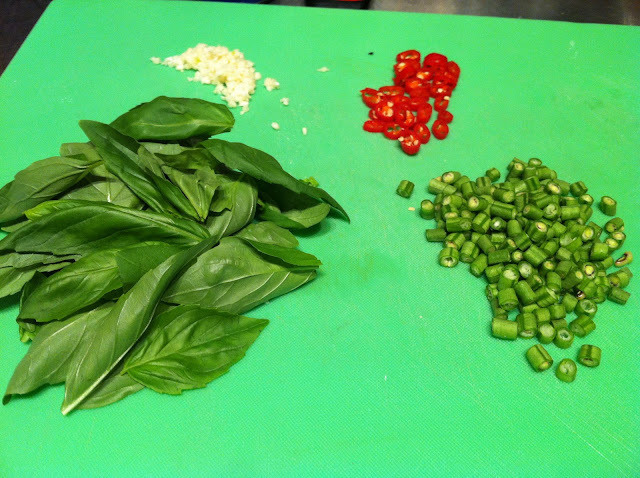 Alright here's the fresh ingredients that you will need and if you were paying attention above I'm sure you will have realised that the basil in the picture isn't actually holy basil, its just plain old western basil. Yes its a huge compromise especially after all my spiel above about bai krapow but decent holy basil is just so hard to get in Melbourne that I'm not willing to sacrifice my weekly fix and for that reason I accept the compromise. (Don't tell Kat though, she seems very angry about the whole thing!) For what its worth I have asked about krapow in Papaya Pok Pok a while ago (after Kat's review) and was told that they use normal basil. I also asked at Pad Thai in Midtown who in my opinion make one of the better versions in Melbourne and I was told that they use holy basil but when I asked where they get it, I was told to go to Woolworths in QV! 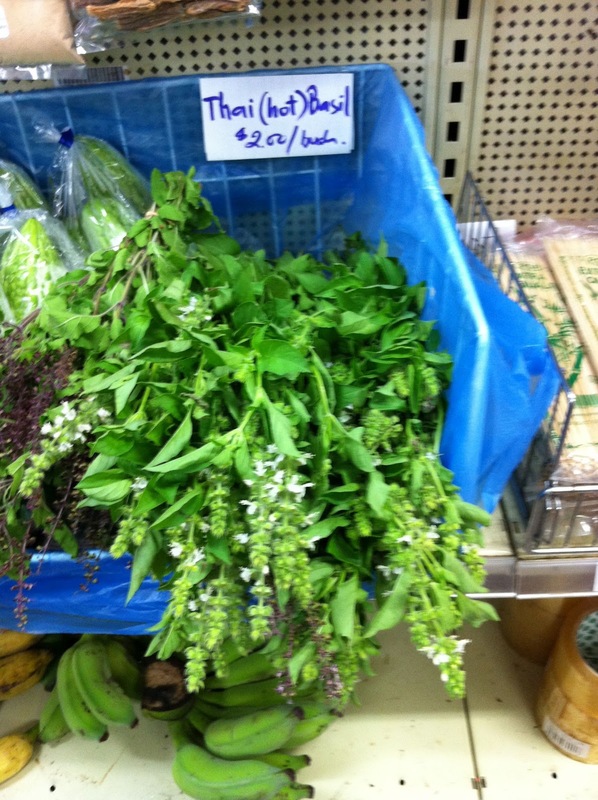 Of course I headed over there immediately and was quite confused to see the same basil that I saw in Pad Thai for sale but of course it was just plain old western basil. I'm not sure if this was lost in translation or just the old 'tell the inquisitive farang what he wants to hear'. Anyway, I was a bit annoyed for a week or two but then I realised how much I enjoyed the Pad Thai version and I quickly got over it. I now think that the western basil provides a much sharper, stronger and slightly sweeter flavour than any holy basil that I've bought in Melbourne. I have used a long red chill this time because I managed to find some really hot ones but normally I use about 4-6 scuds depending on their size. The garlic is a wonderful mini garlic that I buy from a grocer in Springvale whenever I'm over that way. Thai garlic is much smaller and not so powerful as western garlic so you can use a lot more of it and often it is used unpeeled. I'm not sure if this is actually Thai garlic but I like to think that it is. It certainly the closest that I have seen to the garlic I saw in Bangkok. Otherwise I use the chinese garlic that is super cheap and also not too strong, I avoid that pungent purple Australian garlic for Thai dishes. 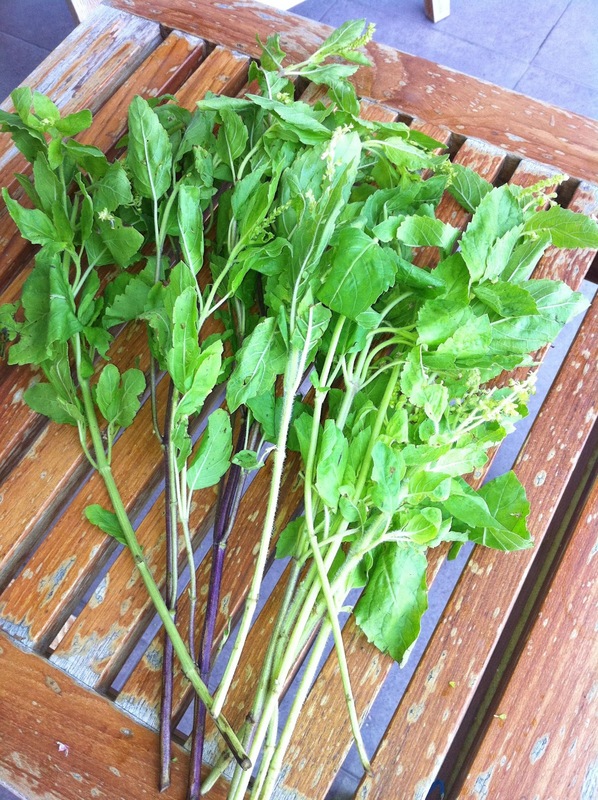 To get started, chop up all the vegetables as shown above and pluck the basil leaves. If I can't get snake beans I will often use baby corn chopped into 5mm slices. I'm not sure this is authentic but it tastes great! You need the three sauces above. I use Lee Kum Kee premium oyster sauce (the expensive one), I've also used the Megachef oyster sauce but I find that it's too salty. 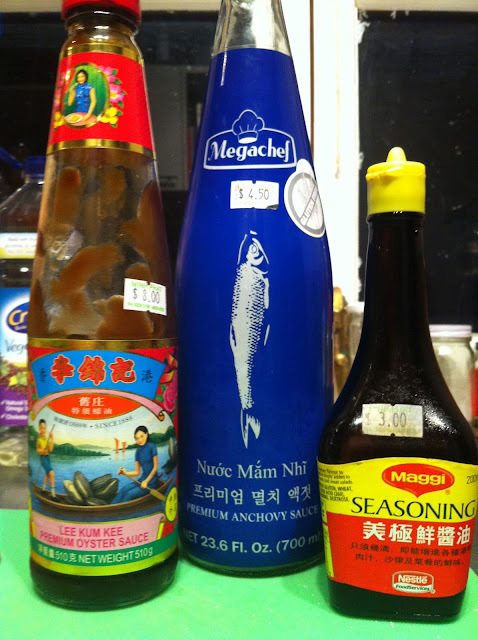 Megachef fish sauce however is wonderful and worth seeking out. The Maggi seasoning is obviously the odd man out here and I use it as as msg substitute. I used to be against msg but I'm over that now. I reckon msg is widely used in Bangkok and I don't have a bag of it in my pantry so instead I opt for Maggi seasoning which I reckon is basically liquid msg. I only use a few squirts and you could probably omit it but that's up to you. 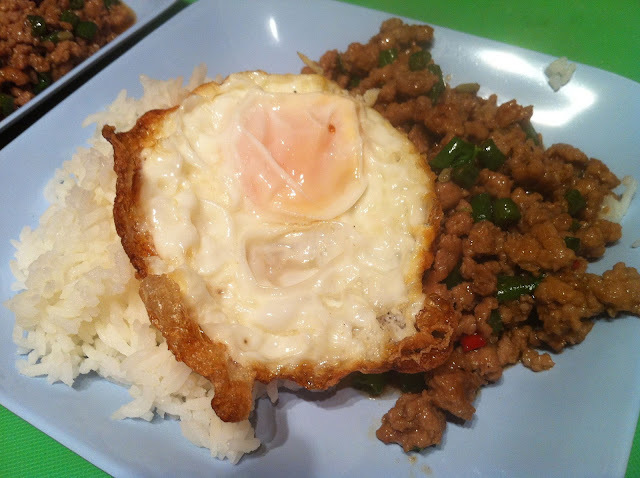 Once you've prepared all the ingredients and put some jasmine rice in your rice cooker you need to fry up the eggs. Add a good amount of oil in your wok and get the heat nice and hot. You need to add a fair bit of oil, similar to a shallow fry so that when you crack the eggs into the wok you can spoon oil over the top to cook the top of the egg. It also helps to achieve those delicious crispy edges. Make sure the yolk is still runny and drain the eggs on paper towel and put them aside. It's very important that your wok is well seasoned otherwise the eggs will stick. I never use detergent on my wok and am actually quite proud of how well seasoned it now is. A key to looking after your wok is to not leave cooked food in it after you have served up. While its still hot the wok should be wiped clean under hot water then dried with a teatowel and put away for next time. Definitely try to avoid metal scourers which will ruin your seasoned wok surface. Add the pork mince first, about 300 grams is enough for two people. I prefer to buy my pork mince from an asian butcher as it seems to have a courser consistency that I think works better. David Thompson suggests making your own mince by chopping up a piece of meat with a cleaver which also produces a course texture but isn't fatty enough for my liking. When the pork starts to brown add the finely chopped garlic then the chillies and snake beans. After a couple of minutes the pork wil have cooked, now its time to add about 1 to 2 tbs of oyster sauce, 1 tbs of fish sauce and a few squirts of Maggi seasoning and about 1 tbs of sugar. (These are rough guesses, I just splash away until I'm happy with the colour) Making sure that the wok is still fierily hot I add a splash (maybe around 1/4 cup) of boiled water to create a sauce. Let this simmer away for a bit then add the basil and cook until it is wilted per the picture above. The cooking process is quite quick and you should have the whole thing wrapped up in around 5 to 7 minutes. Plating up is simple, a pile of fluffy rice on one side, the pad krapow on the other and then its finished up with crunchy fried egg on top! As with most Thai meals, the correct utensils are a fork and a spoon with the fork used in the left hand to push the food onto the spoon which is used in the right hand to scoop the food into your mouth. For meals that require cutting, the spoon is turned on its side to use the egde to cut with. Contrary to popular belief, chopsticks are rarely used by the Thai with the exception being for noodle soups where they are used in combination with a spoon. The chopsticks pick out the noodles and the spoon is used to slurp up the broth. So that's my take on pad krapow, as always I strongly encourage you to have a go at cooking it at home. Its dead easy and absolutely delicious. A bit of trivia to finish with. Most young Thai do not call each other by their legal names, rather each person chooses a nickname (often with a western meaning) and it is by this name that that are referred to by friends. A few examples of Thai nicknames are Benz, New, Bank, Neon, Beam, Fanta, Mint, Ice, Guitar and even Man-U. Brand and wealth references are popular. I suppose this is similar to what happens in Australia although most people have nicknames conferred on them rather that being able to choose their own which often results in less than flattering outcomes. When referring to a Thai by their nickname politeness requires that the prefix khun meaning 'you', so the name becomes Khun Benz etc. Although I am neither young nor Thai I have decided to select my own Thai nickname, yes you guessed it .... khun krapow! 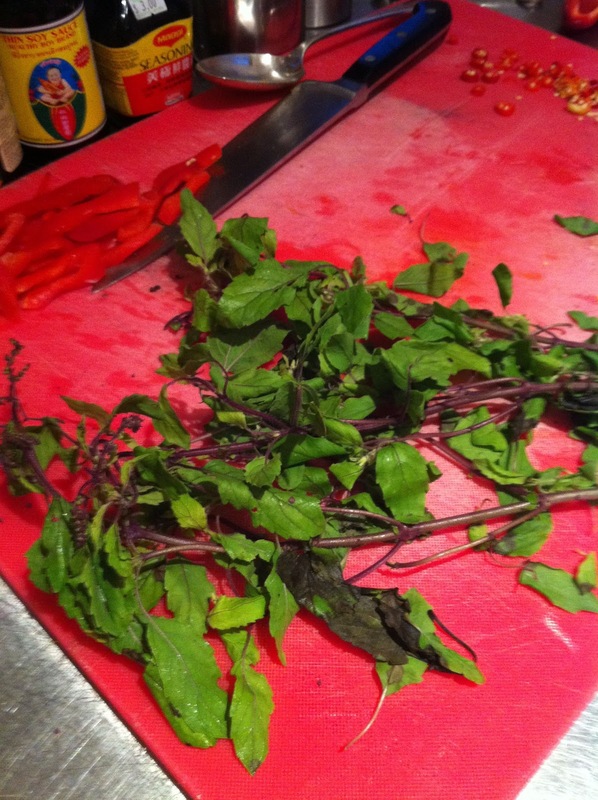 Whilst I gathered the name of your blog had something to do with the Bai Kra Pao variety of basil, I may have under estimated your affection for it. Me Dee does a decent version of the dish, however it never seems to have enough 'krapow' for my liking. Generally speaking, ordering it at most Thai restaurants in Melbourne will only end in disappointment, as aside from using the wrong basil, they also seem to throw in way too many vegetables and rarely mince the protein (pork, chicken, beef). Luckily, I can regularly locate the elusive "krapow" in Springvale and prepare an authentic version at home. 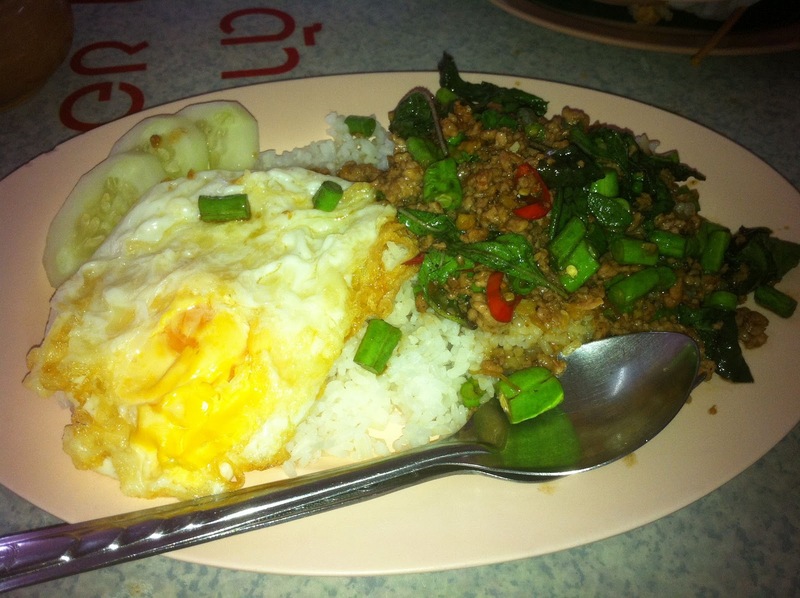 Like yourself, the dish is right up there with my favourite Thai dishes and as you say the fried egg is mandatory. We do use the sweet basil all the time since that's the only basil we successfully grow at home. But somehow it just never tastes quite right. My problem was buying actual gaprow is a whole bunch of $3 will just be enough for one serving so to make decent gaprow for the two of us, it's $6 of herbs! Gasp. The introduction of snake beans in pad gaprow, I reckon, is a rather recent thing. When I grew up in Bangkok (about 20 years ago), no pad gaprow would actually contain snake beans. I suspect it's economic thing to bulk up with meat with vegetables. Interesting when I read a few Thai food forums how people lament the loss of pure meat pad gaprow. Another interesting note is that our Springvale grocer reckons his gaprow is grown in Darwin! I once asked Adam D'Sylva from Coda if he used krapow and he told me that he doesn't anymore because it is flown in from the north and never transports well. I think the snake beans you sometimes see at the Thai grocers also come from Darwin. I hear you about the tiny little bags, I've tried stretching these to two serves and it just isn't enough. The Flavours of Vietnam Cookbook Giveaway!